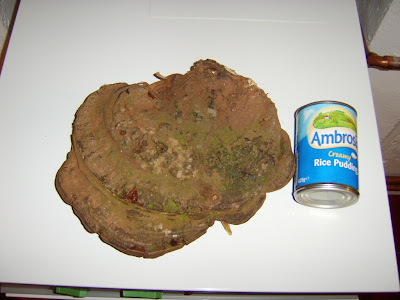 I found an Artist's Conk (Ganoderma applanatum) fungus in the woods and decided to try using it for a stove. I Hacked away the top with a lump of flint to get a flat surface ( the underneath was flat but decided that would give better stability on the ground, i didn't want my pot spilling water). To save time i used some potassium permanganate and glycerol to get a hot coal going. I filled my pot with tap water and then left it, after about 8 minutes i added a makeshift lid. After an hour I still didn't have any boiling water, the water was very close to boiling point, plenty of steam and small bubbles, this was the state it reached after half an hour but failed to go any further. After one hour the conk had pretty much consumed itself. So my stove was a failure, it failed to bring water to a rolling boil but it would of been fine to heat food so it's back off to the woods to try again, my stove was completely energy inefficient so I need to try a different method.